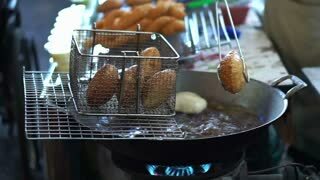 Search Results for "deep frying"
Traditional Chinese food, Hands frying Doughnut, drawing oil from deep-fried dough buns. Vegetable pieces deep fried in iron pan. Deep fryer with boiling oil red onion. 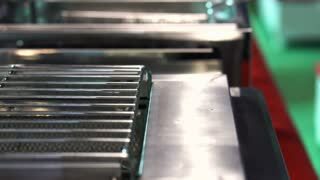 Large, deep fryer container for frying food onion. Restaurant deep fryer red onion wing deep fried on hot oil. Red onion in breading. 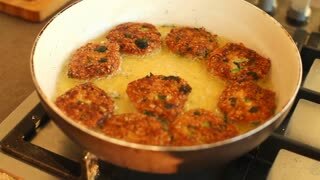 Deep frying and stirring dough soaked in syrup.Traditional Turkish food Lokma, golden fried balls preparing for serving free with professional kitchen utensils. Slow motion. Deep frying and stirring dough soaked in syrup.Traditional Turkish food Lokma, golden fried balls preparing for serving free. 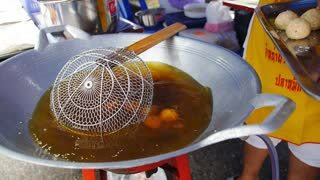 Street food in the Philippines, deep-fried squid balls and fish balls in a frying wok. Deep frying freshly caught reef fish called the Hawaiian flagtail or Aholehole for dinner or appetizers. Home cooking - Close up of deep frying three croquettes or other wraps covered in breadcrumbs in small saucepan being check by fork. 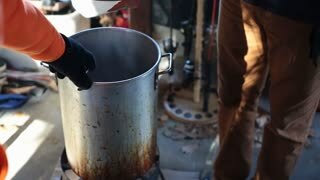 Man lowers turkey into metal cooker vat filled with boil to deep fry the turkey. Junk food preparation, low profile kitchen in a cheap restaurant. Fish fingers ready for deep frying. Young chef with a black shirt.